Our passion and dedication to forestry has helped us create a diverse and skilled team to serve our clients’ best interests. Encompassing a wide range of specialisms within our organisation, we can excel in all that we do. You are invited to take the opportunity to read a profile on each member of the management and technical forestry team. Following a forestry degree at Bangor, Graham moved to Herefordshire in 1990. In 1993 he joined Pryor and Rickett Silviculture as a forester, becoming a Director in 1998 on incorporation. He is personally responsible for over 10,000 acres of forested land in England and has overseen the growth of the company in recent years. For many years, Graham has been responsible for specialist timber harvesting in the highly sensitive nature reserves of the Worcestershire Wildlife Trust and on people’s doorsteps in the community woodlands of Redditch. He has also been instrumental in developing the commercial forestry side of the business, managing investments in the uplands of Wales and further afield, whilst keeping a close eye on the forestry freehold markets. He now oversees the technical forestry team in England, and provides consultancy services throughout the UK. Graham was awarded an MBE for services to forestry in 2017. Ian is a graduate of Bangor University (1998), and a member of the Institute of Chartered Foresters (2001). He joined Pryor & Rickett Silviculture in 1999 as an assistant forest manager, where he worked for approaching 7 years. Following a period with a larger organisation, Ian returned in 2009 to further develop the management of the Company’s Welsh portfolio. He became a Director in 2011, and a fellow of the ICF in 2016. Specialising in the management of mainly commercial forest assets, Ian also has a wealth of experience in the management of lowland mixed woodland, and in other areas where his interest in continuous cover forestry management principles can be applied. Ian overseas the techincal forestry team in Wales and Scotland, as well as providing investment and consultancy services throughout the UK. Charles qualified in forestry at Newton Rigg via City & Guilds and gained the National Diploma in Forestry in 1980 at Cirencester. He became a fellow of the Institute of Chartered Foresters in 2004. He has worked in forestry since 1975, managing his first woodland under the agent Cyril Hart at Leighton near Welshpool in 1982. He later gained valuable experience as timber buyer for the Welshpool Timber Company in the 1980s, being responsible for purchasing 60,000 cubic metres of sawlogs per annum, much of it from Scotland and transported by rail. Later he moved to Dorset to manage 2,400 acres of Woodland on the Charborough estate, which he did for 14 years. 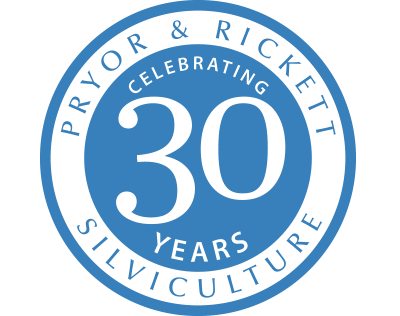 Charles now brings all these different aspects of the industry together under the umbrella of Pryor & Rickett Silviculture. He also specialises in woodland management, the design and build of shoot woods, Christmas tree production and the growing of cricket bat willows. Charles is responsible for client properties throughout Dorset and Somerset, and east to Kent. Arthur graduated from Bangor University in 2003. His forestry career began as a survey forester working all over the UK, before he settled on Mid Wales to become a forest manager. He joined Pryor & Rickett Silviculture in 2009, following an active period for a large forest management company. He has developed a very sound understanding of upland forestry, and specialises in the management of large commercial assets for investment clients. Over the past decade, Arthur has been responsible for the management of over 3,000 hectares of forest across Wales, and during the same period, delivered a broad range of forestry contracting services for a variety of client types. Arthur is responsible for client properties in mid-Powys and Ceredigion. Colleen holds a forestry degree from her native country of Ireland (2008) and a Master’s in Environmental Forestry from Bangor University, Wales (2011). She is also an associate member of the Institute of Chartered Foresters. Following her experience of the tree nursery trade in Ireland and the UK, Colleen joined Pryor and Rickett Silviculture in 2011 as a Forest Manager based at our Brecon office. She is actively involved in the delivery of operational work programmes across a diverse portfolio of woodlands, from shooting and amenity estates managed under a continuous cover regime to upland plantations managed on a more commercial basis. Julian is a graduate of Bangor University (2001). He began his career initially in Devon and Somerset, where he worked on forestry and landscape contracting projects until 2006. After a period of intense commercial contracting, undertaking forestry, landscaping and ground maintenance operations on a wide variety of sites including landfills, military training areas, quarries, airports and new roads, Julian later joined a small ecological consultancy company in 2011 to run their in house contracting operations. There he gained experience of protected species legislation, mitigation and work on large scale flood alleviation schemes and aquatic enhancement works, much of which was done in an urban situation, and the challenges that working environment can present. Julian joined Pryor & Rickett Silviculture in early 2012 to focus on estate based woodland management, and brings with him experience of contracting, especially woodland establishment and planning, overseeing a wide range of operations, utilising direct labour and contractors, and ensuring the most suitable team and machinery is on site for the required task. Andrew graduated from Bangor University in 2008 and then spent five years working for a woodland management and contracting company in the East Midlands, where he managed diverse woodlands, particularly lowland sites where sporting, amenity and wildlife objectives were paramount. He also gained experience of a wide range of contracting operations, specialising in new woodland creation and restoration schemes for the aggregates sector. Andrew joined Pryor & Rickett Silviculture in 2013 and achieved professional membership of the Institute of Chartered Foresters in the same year. He is now responsible for the day to day woodland management of a number of Herefordshire estates. He has a particular interest in the complex silviculture of traditional, mixed lowland woodlands for the production of quality hardwood and softwood timber, including niche species such as cricket bat willow. Chris has a degree in Business Management from Northumbria University and ran a successful IT company in the North-east for 15 years. A strong desire to work in the forestry sector led to him re-training and gaining a Master’s in Environmental Forestry with Distinction from Bangor University. Upon joining Pryor & Rickett Silviculture in 2015, Chris has been involved in the production of woodland management plans, and overseeing harvesting and restocking operations, including those in sensitive SSSI woodlands. Chris utilises his business experience and desire for long term sustainability to ensure that clients maximise profits, whilst minimising environmental impact. This is realised through an increased use of IT systems to streamline forestry operations, which reduces time spent on individual jobs. Chris covers the management of client properties in Southern Scotland, and the English counties of Northumberland, Cumbria & Yorkshire. Andrew has 15 years’ experience managing extensive public sector forests in Wales. Having become a chartered forester in 2006, he is an active member of the ICF, and held positions of secretary, vice chair and lead for the 2014 winter conference in Machynlleth. In 2017, Andrew was elected to ICF Council, representing the Wales Region. He also holds the position of Finance Officer on the Executive Committee and became a Fellow of the Institute in 2018. Prior to joining Pryor & Rickett Silviculture in 2016, he developed Forestry Commission GB’s guidance for producing forest design plans and led national forest planning on the Welsh Government Woodland Estate. Most recently, he led a successful harvesting programme in South Wales to mitigate the effects of Phytophthora ramorum in larch. He delivered over 400,000 m3 of timber per year to market, leading a team of 15 staff in collaboration with customers holding 5-year long term standing and roadside contracts. Andrew leads a group of volunteers in Wales that supports tree planting in rural Uganda. He values the global impact that local forests have on the economy and environment when they are sustainably managed. Andrew is a Welsh speaker. Keira graduated from the National School of Forestry, University of Cumbria in 2015 with a first class honours degree in Forest and Woodland Management. Winner of the ICF student award 2015 and the Prince of Wales Forest Leadership Award, she is also an associate member of the ICF. She joined Pryor and Rickett Silviculture in early November 2015 to assist with the planning and implementation of operations in the Devon and Cornwall area, after completing a three-month internship with The Algonquin Forestry Authority in Algonquin Park, Ontario. Mike is a graduate of Bangor University (2002), following which, he began his forestry career in the North York Moors National Park where he worked on native woodland afforestation projects before moving to Sussex. Since moving to the South East, Mike’s expertise ranges from providing conservation advice for an Area of Outstanding Natural Beauty, to advising on commercial forestry management, and latterly developing local biomass markets and supply chains. Mike specialises in the management of lowland woodland with a particular interest in developing sustainable silvicultural systems for woodchip production and low carbon energy generation. Mike’s specialisms are very relevant to some exciting emergent timber market opportunities in South East England. Ben joined the firm in September 2016 after graduating with a Forestry with honours degree from Bangor University, which included a year’s placement with Northern Ireland Forest Service. Ben brings a wide range of skills from previous roles outside of forestry that he can apply effectively in the planning and supervising forest maintenance and re-stocking operations in Mid and North Wales, north Herefordshire and the Marches. With interests in forest health and establishment, he covers all aspects of forestry in the upland and lowlands. Ben is applying a full range of silvicultural approaches that is necessary for such a varied portfolio, to meet client objectives. Stephen graduated from Newton Rigg in 1997 before becoming a beat forester with the Forestry Commission. Responsible for the management of a wide range of both conifer and broadleaved woodlands spanning from Lincolnshire to Bedfordshire, he successfully implemented a large scale ancient woodland restoration programme and the management of several high profile SSSI and NNR sites.</p? In 2008, Stephen was promoted to lead a team of Technical Foresters and Conservation and Heritage managers covering mid and north Wales. His team was responsible for planning an annual programme of 280,000 m3 of clearfell and thinning, and an annual restock programme of 300 ha. Stephen gained a Masters in Ecology and Conservation with Distinction from Stafford University in 2013. Stephen’s research project investigated how bats use different silvicultural systems in commercial upland conifer forests. Stephen joined Pryor and Rickett Silviculture in 2017 and is responsible for the North Marches, Mid and North Wales portfolio. Amongst Stephen’s numerous interests is how to continue to bring valuable timber to the market whilst still enhancing the forest’s natural habitats and species richness. Stephen also lectures part time in ecology and environmental science subjects at a local University. Felix joined Pryor & Rickett Silviculture in 2015 on a work-based placement as part of his Forestry degree. Following a diverse and educational year based with the team in Brecon, Felix returned to Bangor University for his final year of study. During his placement, Felix demonstrated considerable commitment and enthusiasm for forestry, and in doing so secured a full time position with the firm on completion of his degree. In 2017, Felix graduated with a first class degree in forestry, also being honoured with a prize from the Royal Forestry Society for his final year research project. Following his graduation, Felix returned to the Brecon office, immediately being able to apply the geographical and practical experience of the forestry sector in Wales gained during his placement year. Felix is now building on his knowledge by assisting in the management of a wide range of properties across south and mid Wales, from lowland estates to large scale upland plantations. Felix covers all aspects of forest management, and has interests in a sustainable and environmentally conscious approach to forest management. Samuel Roberts BSc. (Hons) Cons Biol, MSc. For. Sam graduated from the University of Aberdeen in 2017 with an MSc, with distinction, in Environmental and Forest Management. He joined the Brecon Office in January 2018 as an intern and quickly demonstrated his ability with Geographic Information Software to advance existing spatial data management routines and progressing mapping projects for several of our offices. The importance of efficient handling of spatial data was recognised and Sam took on a formal role as GIS technician. He is now responsible for executing digital mapping projects, including the digitisation of new properties, maintenance, analysis and modelling of current datasets, and the creation of new spatial data when an alternative is unavailable. Alongside Chris Hamill and Felix Gregory, Sam is also helping to develop the role of aerial drone surveying within the firm.